How do you gauge if there has been a significant moment in a year. Even with large events like Brexit and the U.S. election of Donald Trump for President in that the consequences of the dramatic change won’t be felt for years or even for a decade. But you know things have changed and for significant reasons. And that the world we lived in before 2016, is not going to be the same place that we will leave as we move into 2017. The same feeling is there with X-Plane. Yes I won’t even try to compare a simulator to important international events on the effects of our lives, but in a way it is smaller things that are closer to us, closer to us personally that we feel the changes more. Yes going into 2017 is very different in X-Plane than when we moved into 2016 just under twelve months ago and of course that is related to the release of X-Plane11. Certainly it is an exciting time to be in X-Plane, I noted last year that we may be in a “Golden Period” that highlight’s the changes and quality that is notable in the simulator, if you think I have “rose-tinted” glasses on then you are wrong, as just a recap of all the extensive features, ideas and speed of the changes that we have lived through the last few years highlights the current position of how far we have come and no doubt this new coming year we will cover even more ground and have more of the realism that we only really dreamed about only half a decade ago. From Laminar Research’s point of view, 2016 was about only one thing. That was tying up all the loose ends of X-Plane10 while at the same time building the future in X-Plane11. The release of v10.50 back in the Q2 of 2016 didn’t help the nerves because the first three beta’s where very buggy, but the version soon was sorted and settled down. So from Laminar Research’s point of view it was a huge and a very hard year of mostly keeping your head down and getting through the huge amount of work to be done, but right now and certainly from Laminar Research’s perspective X-Plane10 is done, finished… completed. At the time of writing this article X-Plane11was still in beta, but I expect it to be in release final by New Year. To a point it hasn’t shown yet on how good it really is going to be. Certainly all the building blocks and features are built in there, but with so little converted aircraft and the huge amount of “Global Scenery” to download, it will take time. If not a few months before it becomes our default application up from X-Plane10. There is so much area to cover, not only in the change of aircraft features, but checking out custom scenery and most of all getting the plugins to work with the new simulator. Bugs aside then Laminar will also have its books full getting the efficiency of the simulator running well (or better) and generally making the simulator as good or as stable as it has to be. My early thought’s are in keeping with the current situation and that to be honest with not a lot of flying in X-Plane11 until it is more sorted and stable, and with a load of reviews on the table to cover in X-Plane10 before Christmas I don’t have the time anyway. But that will change over the Christmas Holiday, going into 2017 then certainly X-Plane11 will come to the fore. Aside from the X-Plane v10.50 update it was the fringe items more than the core simulator that made the biggest changes in 2017. Yes aircraft got more complex and more clever features were added in, but the biggest movers and shakers were in sound and weather. BSS or BlueSkyStar Simulation’s sound packages were a revelation, with first the JARDesign A320neo and then their A330, but you really saw the power of the package when it lifted the ancient JRollon CRJ-200 up to heights that it didn’t really deserve. But the differences were on another planet and shows that great sound is now a major element of flying in X-Plane that has been left out far too long from our flying environment. Laminar Research has also got into the audio act with the addition of FMOD Sound into X-Plane11, or the tools to create great sound, so no doubt you will start to see the results of this new audio era in 2017 but if it is anything like the BSS impact then it will transform even the most basic of aircraft to a new level and that includes 5.1 surround sound. The year is closing with another element to X-Plane that is changing big time… weather. If you want to note one of the less favoured headline features that didn’t make the grade in X-Plane10 it was the weather system. Yes Laminar Research wrestled with it and got some sort of efficiency out of the engine over the years, but they spent so much time allocated to that then not much was done in actually improving the weather system to the sort of level it really should be at by now. So it is down to the 3rd parties to fill in the gap and do something about the problem. A lot of people had a throw at the problem, but in most cases it just made it worse and messed up your root X-Plane files in the process. A breakthrough came with Sundog's Sky-Maxx Pro series and it was that in being finally a breakthrough in creating a decent weather engine. But it was dogged in the early days by poor framerate problems that were sorted, and the plugin did become a standard for better weather in X-Plane and is now in v4.0. But a newcomer developer to X-Plane in Commercial Simulation Systems could really change the weather game with their product called xEnviro. I have to date only used it for a few weeks, but it has totally changed my X-Plane flying environment. I am very excited about this plugin going into 2017, updates have been coming thick and fast (already v1.05) but it creates a world around you that has to be used to believe. Yes it is expensive, but I would note you will very quickly forget about that investment once you use it (make sure you give it time to settle in)… certainly a new era and with no large framerate hit, that is a Christmas present worth having. In aircraft the year started out with a lot of heavy debate for a few months about Rotate’s MD-88, and most of it was nasty, and it made me quite angry. A first time developer created a great product, not perfect, but great. But most users stripped strips off the product and most of it was totally unnecessary, then as now I really love the aircraft and have flown it consistently all throughout 2016, it was updated frequently and new features were added so what is your problem, but the outpouring of vile was not needed and could (or still might) cause the developer any other wanting to give X-Plane and it’s community a miss, and I wouldn’t blame them either. As I noted too many times within the year is that any purchase in the simulator is an investment, so buy wisely. And that investment is over years and not just the first few minutes of downloading it into the simulator, a few well used good investments is far better than loads of product you will never use. Late March and early April is now the really busy period for new product for X-Plane, and now not actually at Christmas. It was chocker this year, with Colimata’s F/A 18F “Rhino” Hornet, then MLADG’s Messerschmidtt Bf 109-G2 and also Khamsin and he finally released his magnificent North American P-51D Mustang and while we had a great year for fighters then don’t forget X-Trident’s very good Tornado and RW Design’s Spitfire. Aerobask had a big year as well with his Viperjet, Epic Victory and Epic 1000 all with that new “Skyview” interface. The Piper Cherokee PA28 from vFlyteAir was a little gem. Carenado was quiet early in the year, but then released the Cirrus SR22, TBM 850, PA31 Navajo (which I really loved) and the excellent AeroCommander “Shrike” 500s straight after Butnaru’s AeroCommander. Both were good, but I do prefer the Carenado version. There was a lot of REP (Reality Expansion Pack) packages this year for a few Carenado’s and they are very well received. Helicopters... what helicopters, only one release with the Schweizer S300CBi Helicopter from Dreamfoil Creations, but at least it was a good one. The personal Jet got a boost with RW Design’s and the Hawker 4000 and it was great to see Dan Klaue back with the enigmatic but very clever Quest Kodiak. Two long term projects finally came to light with EADT’s Boeing 737-800 v5, which brought you that amazing virtual cockpit and it was free. IXEG finally also got their Boeing 737 Classic out of the door with glowing reviews, but it was still missing a lot of features that should have been as part of the expensive deal, for me over AUD$100+ was a money stretch too far after spending all my life savings on a new computer. Felis Planes put out his excellent TU-154M, but with no English manuals to fly it, it stayed grounded, a lesson there. PMDG released their DC-6 Cloudmaster mid-northern summer, and surprise, surprise it was very good, if not excellent, no word on if PMDG will release another product in X-Plane, but the DC-6 was so very niche it certainly didn’t give them the sort of feedback that was really worthy of the simulator. Both X-Craft’s and SSG put out v2 aircraft of their E175/170 designs, both were very good especially the SSG E170, but both were let down by fatal flaws. One serious favourite was Wilson’s Aircraft DC-8, I simply love the aircraft besides it’s obvious flaws, just brilliant to fly and it looks excellent, the Boeing 707 is getting the same treatment, so roll on more of the sixties. And then there was another aircraft trend in 2016, the Version 2! FlyJsim updated the Boeing 727 Series to v2 with the “Study”, Both X-Craft’s and SSG brought out v2 versions, and at the end of year FlightFactor/VMAX realigned the excellent Boeing 757 to v2 status (carbon copy of the Boeing 767) and all aircraft were new purchases with discounts for earlier buyers… it will be interesting to watch this trend continuing into 2017. JustSim was the most prolific developers this year of scenery. LOWL-Linz, LEGE - Girona Costa Brava, LOWK - Klagenfurt, LOWI - Innsbruck, LBWN - Varna, LOWS - Salzberg, LFMN - Nice and LEBL - Barcelona and you needed a diary to keep up with them all… all are excellent for their prices, and are really good scenery fillers, but LFMN Nice was a favourite. So was Aerosoft’s excellent update to LSZH - Zurich that finally made the scenery usable again to another v2 title. Aerosoft’s earlier in the year release for KRSW - Southwest Florida was also excellent, and has seen a lot regular visits for reviews because I really like the scenery and its position. Pilot+Plus had a change of direction in size this year with LSGG - Geneva, EGKK - Gatwick and the smaller LEIB - Ibiza, but you missed the more intimate and detail of their original work. Drzewiecki Design released a great Baku and an excellent Moscow City. One area that X-Plane still really suffers is in is city skylines, Moscow City proves it can be done and my wish is that scenery developers or the community will start to put these skylines on high their agendas in 2017, nothing fancy, but anything is better than the nothing we have now. I loved and totally used JARdesigns excellent “Ground Handling Deluxe” all year, a favourite and X-Life Deluxe was an interesting package to make airports alive. It is brilliant, but I don’t like the reliance on X-Plane’s limited A.I. System in aircraft and framerate and a second issue is another reliance on X-Plane’s built in ATC ground-routes. Granted Laminar Research is putting a lot of resources into both items, certainly the ground routes, so that might finally make them reliable. But I still use Classic Jet Simulation's, World Traffic. It is still slightly awkward and time intensive to use, but once you get the idea it works very well and like xEnviro it is easy to switch off by being totally separate from X-Plane. CJS in 2016 abandoned the rest of WT v2.0 development and has moved directly on to v3.0, but time is catching up with WT as Laminar Research is putting a lot of effort into the same area, so it looks like 2017 will be a year to breakout or sink for WT, I hope v3.0 soars as it is a great plugin. I made the Sundog's Sky-Maxx Pro series weather plugin the best of the year in 2015, but I think it has competition for the title this year. The biggest success for me was just completing the “Behind the Scenes” article each month in 2016 and I hope they give you a sort of commentary of the things we don’t mention in the reviews and what goes on behind the scenes in X-Plane. We are also always looking for reviewers for our site, and it is a great way to get involved closer to X-Plane and contribute more to the simulator. 2017 is obviously going to be even bigger and far better than last year as X-Plane settles into its new version with X-Plane11, and one of the great things about X-Plane is that sometimes you have absolutely no idea what may drop into your download box next, and mostly it is something really great and exciting. It is a great aircraft, but not complete for the money. Just completely different, and a very interesting aircraft to use and fly. For basic GA flying at it's very best you just can't go past it. It is brilliant, clever but the feel is slightly quirky. Easy, the only one released for the year, but still very good. So detailed and very realistic, but it costs you a lot in framerate. Finally as good as it should have been in the first release. They delivered both the 10.50 update while building X-Plane11, and taking X-Plane to a totally new level, it breaks you just thinking about it. JARDesign really delivered a lot this year with frequent A320neo and A330 upgrades, brilliant clever plugins from the Ground Services to X-Life Deluxe it was a bumper year. The Environment Engine plugin is brand new and just kills it... Brilliant! Lifts the ordinary aircraft into the extraordinary, gives you the aural detail that was missing. .... X-Plane11, and don't forget that. Worst Moment of the Year 2016 : Ugly diatribe on the forums that was unwarranted against developers that didn't deserve it. Biggest distraction of 2016 : Users jumping on the forums without checking out the details. Personal Favorites of 2016 : The CRJ-200 with BSS, 1900D Carenado King Air, MD-88, Boeing 727 Study, Boeing 757, JARDesign A320neo with BSS, DC-8, PA31 Navajo and AeroCommander "Shrike". 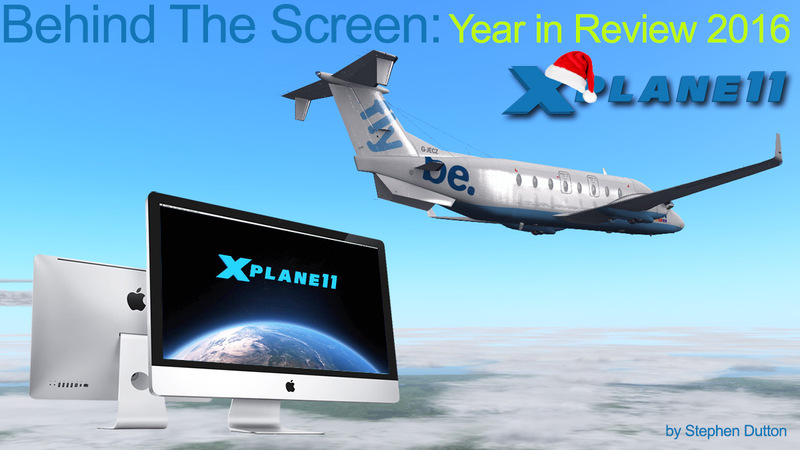 That is X-PlaneReviews for 2016, and we will be back after a very much needed break and rest on the 9th January 2017. We of course wouldn’t exist either without you the users and your contribution to both the simulator and to reading this site and your comments, so thanks and tune in again in 2017 for more in-depth analysis, great detail, inside and future product news as X-PlaneReviews heads into its 4th year. happy new year and thanks a lot for giving your GA award to vFlyteAir's C140 package! This was a nice surprise and I forwarded that to Walker and Igor!